Last week I demonstrated how to set up a training session so a horse can learn to stand still around something that scares them even when allowed to spin, trot or canter away as an initial response. I focused on the expression of the flight response not presenting a roadblock to calm, relaxed behavior if it happened in the context of a positive reinforcement paradigm. To be clear, though, the training session I set up for Tarot had many more components than simply allowing a flight response. Just allowing him to run away wouldn’t have helped him access behavior change. The other crucial elements in setting up this session for Tarot were choice, stimulus predictability, reinforcing active coping skills and presenting only one component of the stimulus per training session. What choices was I able to offer him within the structure of our session? I left him loose so that he didn’t have the halter and lead putting physical or emotional pressure on him to stay, as had been done in his past. He could run as far and as fast as he wanted from the spray and he didn’t have to come back if he didn’t want to. To be fair to him, I wanted him to volunteer to work with the spray. He would vote with his proximity. Just like a human at a therapy session who can say “I don’t want to talk about that right now, I’m not ready,” I wanted him to be able to choose not to “talk” about his fear of fly spray. If he had left and not re-engaged after the initial spray, I would’ve put the fly spray away and worked on familiar exercises he knows and enjoys. If I were able to go back and change one variable in the training session, I would have conditioned the word “Spray!” to the lift of the bottle and then the active spraying three to five times outside his paddock, so he understood the predictive relationship between the two. He understood it within the span of the session but it was a small hole that could have and probably did undermine his relaxation. In Tarot’s case, when he chose to walk toward the fly spray, an active strategy, I clicked the behavior, a yes answer, and stopped spraying and lowered the bottle (terminated the stimulus). For him, the sound, smell and feel of fly spray elicits a deep, conditioned fear response. Just teaching him to stand still or be passive and allow the spray to happen doesn’t give his brain a new response to code and use in the future. He has to be active in the process. He has to do something. Fly spray isn’t one dimensional. I can’t ask Tarot if the sound, smell or feel of it is the most alarming to him. So, to avoid making it too difficult for him to change his behavior, I have to make sure to “split” the presentation of it. In our first session, I only present the sound and visual of the spray. I have the bottle filled with water so there’s no unfamiliar scent and I only spray NEAR him to avoid the physical sensation of the fly spray hitting him. Once he is completely relaxed with spray near him, then I will move to actual spray with scent near him, then then spray with water directly sprayed onto his body and finally real fly spray sprayed directly onto his body. Not only was Tarot more relaxed this time, he never chose to leave. Because there was no flight response, I couldn’t reinforce walking back toward the spray as his active coping strategy. Instead he offered incremental movements of his head-down behavior as a new strategy. You can see him begin to offer the head lowering almost immediately upon initiation of the spray. This behavior is totally uncued and is completely self-directed by Tarot. He is driving the session. Another horse might choose a totally different behavior and that would be acceptable too. For Tarot, head-lowering says a lot about his emotional state. Horse’s heads tend to shoot up when they are nervous, their backs invert and their muscles tense and are ready for action; this makes Tarot’s choice of active coping particularly lovely, as a signal of relaxation. By lowering his head, he is reducing his binocular vision, less ready to flee and adopting the beginning of a “grazing posture” which only happens when there is no threat. He gives several long blinks during the session, very different from the wide unblinking eyes of fear. In addition, on the last repetition with the spray, he even gives a long sigh, indicating a release of tension. When I assess what Tarot learned in his session, the measurable changes are: he is able to be voluntarily in proximity to fly spray, he is able to stand near fly spray and he is able to offer head-lowering while fly spray is actively spraying. These are huge changes that took place over only two training sessions. Learning to offer our horses scenarios to practice active coping and learning to offer them real choice gives fearful and anxious horses a chance to have a better quality of life. Using these tools can help them access both safer and more functional responses so that living in our human world feels more predictable and easier. We all deserve a chance to re-route our fear rather than be trapped by it. How many times have you heard the phrase, “You better make him stand still!”? 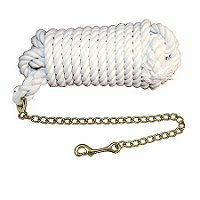 It reflects a common belief system in the horse world; if your horse is afraid of something, the clippers, fly spray, a new blanket, he can only get used to it by being held in position, until he realizes it won’t hurt him, or that he cannot get away. Common equipment like stud chains and twitches are used to inflict severe localized pain in order to deter horses from moving when the stakes are high. It’s part and parcel of the way things have always been done. Part of this impulse to make a horse stand still reflects a reasonable safety concern. Horses are large animals and when they are scared and unaware they can be dangerous. Teaching them to stand still makes them safer to be around. Wanting to hold them in position is often just a natural human response to control a volatile situation and make it feel safer. Another part of the impulse to make a horse stand still is lack of empathy. Humans just aren’t flight animals. A horse’s many fears can seem unreasonable to us brave humans, so we dismiss their legitimate concerns and over-power them with force. They learn that whatever they are scared of is less worrisome than the human with a chain over their nose. They choose between two evils, so to speak. There is a horse training book by Andrew McLean, The Truth About Horses, that clearly states that any “hyper-reactive flight response” (ie moving away, spooking or bolting) should be immediately “disallowed” by demanding a downward transition through the rein or lead with “as much force as necessary.” The theory is, if the horse is allowed to express his flight response, he will become increasingly conflicted and difficult to handle. When talking about getting a horse used to clippers or other scary stimuli, he states,” When dealing with nervous horses, care must be taken not to allow the horse to increase the distance between itself and it’s handler.” The horse must be made to stand still. But is this really the sole truth? Could there be other ways to teach a horse to relax without inhibiting his flight response? 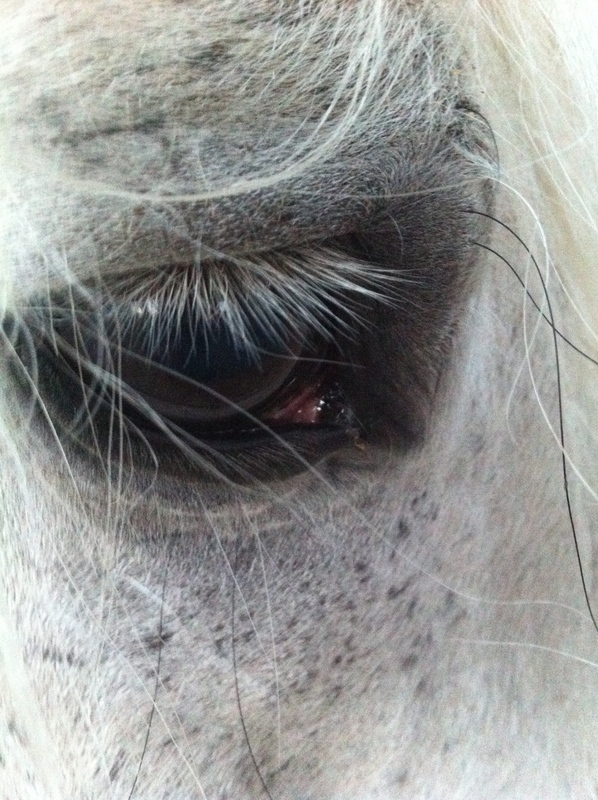 My stallion, Tarot, as many of you know, is an extremely cautious horse. He’s grown to accept many things – shavings bags flapping near his feet, ropes dangling, and me in my raincoat. But fly spray is something I’ve avoided. He allows me to wipe him down with a washcloth, so I’ve chosen to do that and get the job done rather than go through the process of getting him used to the sound, tactile sensation and smell of the spray. But, the other day, I thought I would see if I could create a training session for him that would allow him to offer standing still near fly spray by his own choice. I knew I had to set up the structure of the session so he could understand what I wanted, and offer him enough choice to foster relaxation. I knew he had to be loose, because I didn’t want to be holding on to the spray and his lead rope. He can bolt when he is afraid AND trapped; he runs off when he hears fly spray even outside his paddock, when I am dousing the wash cloth, for instance. After three or four targets, I raise the bottle, announce, “spray”, and begin to spray again. From the video you can see that Tarot very quickly decides he can stay near the spray on his own. So what gives? Why, when I let Tarot put distance between himself and me with the scary stimulus, does he not get more reactive and, instead, becomes more relaxed and quiet around the fly spray? 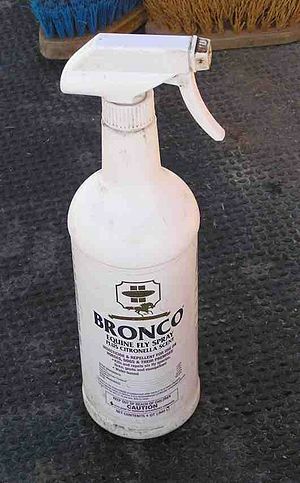 The truth about horses is that allowing your horse to put distance between himself and you with a scary bottle of spray only causes problems if you train with negative reinforcement. It’s not a truth about horses at all. It’s a truth about a training method. Horses working in the negative reinforcement paradigm experience release of pressure or gaining some distance as relief. It’s the currency of that paradigm. Because Tarot is working for a click and a treat, something he actively wants, instead of to avoid something he doesn’t, he is willing to approach and look for what I want once he’s moved far enough away to relieve his fear. Using a positive reinforcement paradigm, the rules change. He can express his flight response and still learn how to stand still. We have to be willing to look for new answers and revise our long accepted beliefs about these magnificent creatures. When we think outside the box, horses like Tarot, who panic in traditional training scenarios, are able to succeed beautifully. The truth about horses is they are brilliant learners if only we know how to set up the lesson.